I'm gonna start with the end on this one: BUY THIS ALBUM! I'll say it again, just in case you missed the start: BUY THIS ALBUM. It will only get better with repeated listens. 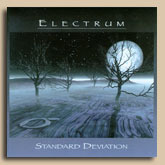 One of the highlights of 2002 is Standard Deviation, Electrum 's second release. It is an all instrumental affair, though there are a tweensy bit of vocals on "The Will To Power" which opens the album. It's been a long while since I reviewed their debut, Frames Of Mind. About the same length of time as between albums, as Frames Of Mind was released in 1998 and this in 2002. Yet, Electrum remains Gino Foti on bass and synthesizers, Dave Kulju on guitar and synths and Joe Musmanno on percussion. This second release from Massachusetts trio Electrum steps several times above their already fine 1998 premier release Frames of Mind. That means that this is one heck of a good album. But where Electrum stands on its own is the use of more symphonic elements. "The Impudent Piece of Crockery" incorporates some lovely textured guitar playing. "A Fugue State" runs though several styles such as hard rock, jazz, prog-rock and features some excellent syncopated melodies. There is not a naff tune on the disc. In short, this is a superb example of finely crafted progressive rock. Highly recommended. Right from the outset of this CD I had the distinct feeling that I was going to enjoy this band. Opening with some precise bass harmonics, dexterous and flamboyant drumming, with solid and innovative guitar work, my early perceptions were quickly confirmed. Not an easy listening album, but one full of dynamic and complex arrangements, ever challenging timing changes, and nicely melodic sections. So, definitely not one to put the feet up to after a hard day and chill-out to, with a glass of beer or a cup of coffee. Standard Deviation follows up the band's first release from 1998, Frames of Mind. I had toyed with the idea of doing a track by track pr�cis; however two factors deterred me from this idea. Firstly this type of write-up is always more difficult with instrumental albums and secondly I felt I could be writing for weeks as each track was a multitude of ideas. Eventually I came to the conclusion that my initial thoughts may be the simplest approach - comprehensive notes on each of the individual tracks can be found at the band's website. As a possible guide I had considered the music to have influences from the following, either on each of the individual members or the band as a whole - Rush, Brand X, Steve Morse & Dixie Dreggs, Bruford (early), Chick Corea Electric Band and John Petrucci (Dream Theater). Illustrations as to the material and possible highlights would be as follows. A Tense Bow... A Moving Target; a brief but complex piece with time signatures abounding (it certainly lost me at times) and includes solo sections from each of the individual musicians. The Impudent Piece of Crockery; a superb track concentrating around the stylish guitar of Dave Kulju. The opening track The Will to Power, which contains all the elements that make up Electrum's music, one of those tracks that if you decided you were not keen on a particular section, the band had already moved on to the next. Electrum's progressive leanings are best captured during the final half of Seven Falls, Eight Rises, a splendidly orchestrated section. So trying to put Standard Deviation in a nutshell, we have an instrumental album that is both complex and diverse; subtle and themic, whilst covering many styles and constructed around a "power trio" framework. At times jazz rock, jazz fusion, power prog (is there such a thing? ), symphonic progressive rock and so on. A visit to the bands website is probably on the cards as samples from each of the tracks can be found there and possibly enough of a taster to get the flavour of this album. Many rising instrumental bands cite King Crimson, Zappa, Yes and even classicists like Stravinsky and Beethoven among their big influences, but how many really arrive with something new and different? On Standard Deviation, the group picks up from where groups such as Gentle Giant and Camel left off at the end of the '70s. Although Electrum's music is completely instrumental, their musical mastery speaks volumes. Both Foti and Kulju add in some fine synth keyboard passages making the music sound even more fully developed. The music on Standard Deviation falls under the instrumental prog-rock banner, but the trio's cutting edge performance and ingenious compositions will also impress jazz-rock fusion and New Age fans alike. Standard Deviation by Electrum is a collection of strictly instrumental progressive rock compositions in a fairly conventional rock format. The group has put forth a great effort in the composition of instrumental tracks that have been implemented with refined and polished playing, and delivered in a tactful, well-produced package. The composition presents the listener with some interesting influences in style that span a wide range of conventional and instrumental rock that are woven together into a unique, comprehensive, cohesive style that posesses plenty of drive and direction. I have tried to figure what the conducively receptive audience for this album might be and I am a little unsure because this album seems to fall somewhere inbetween conventional rock and the virtuoso-based instrumental rock that most instrumental fans are inclined to listen. But, I am thinking that, like me, many fans of instrumental music will appreciate this album for the well-conceived compositional content, good production, well-felt playing, and enjoyable music that it posesses. This is the second album of Electrum, the debut Frames Of Mind released in 1998. The band has a penchant for using differing signatures and make a brand of intrumental prog at times inspired by the writings of Nietzsche. The band sent me a long list of distributors and I would be surprised if you can not find it anywhere. It's clear that the music that is presented on the second Electrum album "Standard Deviation" is as far from Neo as Neo itself is far from Rap (damn, why did I put this foolish word here?). Also, it's not your typical Classic Art-Rock album. It's kind of an extravaganza of complex time signatures that dance round the axis of each composition and crush it with the persevering regularity. "Standard Deviation" comes highly recommended to all those who are tired of a shady stability that, alas, is present on most of the contemporary works of Art-Rock genre. When a band states that two of its instrumentals are based on certain treatises of Friedrich Nietzche, you know you're not going to be getting any lightweight musical frivolity anytime soon. Not only that, however, but the suspicion that the aforementioned work is going to be quite involved and thematically schizophrenic should also enter the picture for the sake of preparation. Ah yes, welcome to the world of Electrum and its sophomore effort Standard Deviation, a collection of precise and intricately arranged instrumentals devised to get the listener's brain toiling away at the musical nuts and bolts that are pieced together here like sharply fabricated counterparts and laid down for posterity. Yet philosophy according to Nietzche should not constitute the background of this brief worded exploration of the album, but rather the field of mathematics, which seems to pretty much dominate the focus of this American trio's attention and conduct it into careful calculation. Not only in terms of odd meters, runs, thematic changes, and instrumental precision, but more importantly in how Dave Kulju, Joe Musmanno, and Gino Foti each allow themselves only the exact amount of time needed and with the exact right timing to demonstrate their respective skills, with all the remaining time dedicated to forging one single instrumental entity out of their collaborative efforts. In other words, these guys play what needs to be played; nothing more, nothing less. Certainly not a bad quality to have in a field of music in which it is almost too tempting and easy to engage in reckless overplaying, and one that reaps its benefits particularly with Foti's ability to create a solid and dynamic harmonic backdrop every single time and then lock on to Musmanno's drums in a split second. Moreover, it is a precious characteristic to rely on when one considers the fact that tracks such as "The Will to Power" and "A Fugue State" are in a constant condition of change and thus in constant need of such harmonic coherence. And by the time the listener is introduced to the pensive sweetness of "Degrees of Freedom," the dire tension of "A Tense Bow�A Moving Target," and the angry and almost jarring attitude of "Apartment Living," it's pretty obvious that the coherence of Electrum's music is due to the perfectly calculated and designed intentions of its creators. A bit too perfectly, perhaps. While there is really not much to be faulted within the clever construction of Standard Deviation and its instrumental variation, there is a sense of excitement that is generally absent from the proceedings. True, one can almost touch the ethereal delicateness of "Degrees of Freedom," and the thematic changes within its instrumental comrades carry within themselves a certain emotional impact, but the album nonetheless sounds too matter-of-factly. Perhaps it could be that mathematics just held the grip of interest all too firmly this time around, but regardless of that shortcoming, the end result is quite interesting, and doubtlessly a good display of the balance and understanding of tension and release that this trio possesses. 2nd album from US instrumental trio heavily influenced by Rush. Electrum consists of Dave Kulju on guitars/synths, Gino Foti on bass, and Joe Musmanno on percussion. This is a far more accomplished and mature effort than their debut, Frames Of Mind. I am particularly drawn to the band's ability to balance delicate acoustic parts with heavier electric elements creating strong dynamic contrasts. If you dig stuff like YYZ than this will definitely scratch that itch that Rush seems to given up on satisfying. The 2nd Electrum represents a major leap forward for the band. Having shed most of the Rush influence, this is now first-rate instrumental progressive, with keyboards and melody playing a much larger role than on their debut [Frames of Mind]. The band navigates frequent tempo and time signature changes without drawing attention to them, and the album culminates in a 14-minute piece representing their most symphonic work to date. Long-awaited second album and they've come up with another good one, again wholly instrumental, featuring guitars, synths/keys, bass and drums, with compositions that stride manfully on, covering an assortment of influences within a fundamentally pro-rock framework. You'll hear passages from classically-influenced, through bluesy to fusion-esque, but mostly, pure prog-rock structured compositions played, arranged and produced cleanly, while still getting across the bite and depth that the band possesses. The compositions are taken at various paces and sometimes you'll get a languid feel with ringing guitar chords and melodic piano, synth backdrops and tasty rhythm section, while at others, the tempo accelerates but the melodies remain. The band plays superbly throughout, with the guitarist taking a lion's share of the lead work. The tracks are extremely tasty throughout and it is the wide melodic variety as well as a strongly cohesive sense of playing, that makes this latest album a really pleasant and highly enjoyable musical travelogue. Electrum plays blistering prog with a definite rock edge. The music is powerful and heavy but not metal at all. The musicianship is excellent and tasteful. They have their own sound but fans of Rush's power trio playing will enjoy this music. It's been 4 years since the debut release by this band called Frames of Mind, and it seems that everything that lacked on that CD has been addressed on this one. A band that came together by virtue of the Internet, and each members affinity for the Canadian progressive icons Rush, they have combined this love for Rush's more progressive side, and introduced these elements into their own instrumental music. I also am noticing a band that has improved a lot as musicians, this goes along with the quality of compositions, and makes this a very listenable CD. This band writes in a style that focuses on their abilities to play as a group, and it is complex enough to keep the progressive listeners attention span from start to finish. You won't hear any blistering guitars, virtouso bass renderings, or drumming that will soon make you forget Neil Peart, but as a team this band is showing that they are capable of creating music that should draw attention from the lovers of Rush and just great instrumental prog in general. Another trio but from Massachusetts with their sophomore 7-song effort of definite Rush influence (w/o the vocals). The band has quite an extensive background as far as experience playing, degrees in music, dabblings in audio engineering, as well as the trio having similiar influences of Rush. Electrum is a burst of modern achievement combining the influences of icons with their newer blood, tainting the overall performance of what's rightfully their own identity. Secondo album per la band statunitense degli Electrum, nata nel '96: il chitarrista Dave Kulju pubblica un annuncio su "The National Midnight Star" (mailing list dei Rush), risponde il bassista Gino Foti (d'origine messinese), in seguito arriva il batterista Joe Musmanno. Si debutta nel 1998 con "Frames of mind". "Standard Deviation" si articola su un interessante concept: la relazione tra musica e matematica, la "deviazione" da standard e modelli consolidati, concetto visualizzato nel ricorrente simbolo del Sigma e nella bandiera stracciata. Interessante anche se si tratta di musica strumentale (dei testi con i quali approfondire il discorso non avrebbero certo annoiato, il booklet non � cos� eloquente...). Formazione "triangolare" ed influenze letterario/filosofiche (Nietzsche ad es. ), l'influenza dei Rush � presente ma non prende quasi mai il sopravvento: ad alternarsi sono stacchi hard, sfumature new prog, pause quasi new age, passaggi fusion, il tutto dominato dalle chitarre di Dave. Quelli di Camel o Hackett potrebbero essere, quindi, dei riferimenti spicci, in realt� il sound risente solo a tratti di questi artisti: l'album � idealmente divisibile in due parti, i primi tre pezzi scritti da Foti, gli altri quattro da Kulju, il tutto per� risulta omogeneo e maturo. Non lontani echi della migliore fusion, gli stessi che animano l'avvolgente "A Fugue State", interessante per le numerose influenze, progressiva per la naturale tendenza alla fusione delle stesse. Su una scia vicina il latimeriano e romantico episodio di "The Impudent Piece Of Crokery", un brano struggente dove la chitarra di Kulju svetta per ispirazione e drammaticit�. A mio avviso solo un orecchio superficiale potrebbe ritenere scialbe certe composizioni, serve dunque un ascolto ripetuto ed attento. Dopo il corrosivo tecno metal di "Apartment Living" (tra Fripp e i Fates Warning di "Pleasant Shade of Grey"), la conclusione � affidata all'imponente "Seven Falls, Eight Rises": la lunga durata � terreno adatto per cesellare suggestivi rilievi in cui i Rush progressivi sfidano Hackett o gli Yes pi� adamantini. Ottimo lavoro ritmico, chitarre di evidente espressivit�, aperture sinfoniche e momenti pieni di tensione melodica, preziosi interventi di piano ed un ruolo di contorno per i synths (un tastierista di ruolo a mio avviso non sarebbe poi cos� inutile), chiamati ad incorniciare di mistero o di fragranze campestri gli itinerari tracciati da Kulju. Per me un lavoro interessante e piacevole, ritengo che, pur non essendo complicato od ostico, necessita di non pochi ascolti per essere apprezzato in toto. Nulla di eccezionale ma se vi capita a tiro non lasciatevelo sfuggire. Hats off to Electrum! This is a great instrumental progressive rock/fusion CD, a quantum leap forward from Frames of mind. It has the same good things going for it - prolific chops blended with complex, interesting arrangements and melodic content. This CD also contains the only thing I felt was missing from the first CD - more lead guitar work and soloing. Dave Kulju is an expressive, melodic guitar player and it's nice to hear more of him. The rhythmn section of Gino Foti & Joe Musmanno bring to mind the outstanding musical interplay between Geddy Lee & Neil Peart. The collective playing is interesting without being over the top. This is a must have CD for fans of Rush, The Dregs, Dream Theater, Yes & Eric Johnson to name a few.